It’s been more than nine months since regulators overhauled European market structure, but things haven’t gone quite to plan. Negotiations on the revised Markets in Financial Instruments Directive — or Mifid II — started in the aftermath of the financial crisis, with transparency dominating regulators’ thinking. This was obvious in the final legislation through rules that separated payments for trade execution and research, introduced pre and post-trade transparency for fixed income instruments and pushed over-the-counter derivatives onto regulated markets. But as it relates to equity market structure, that relentless drive toward transparency has arguably gone too far, leaving traders and brokers grappling with unintended consequences and a more complex trading-venue landscape than ever before. In the year before Mifid II’s introduction, an average of 42.4% of European trading was done on traditional, lit stock exchanges and multilateral facilities, where bids and offers are posted publicly. But regulators were worried about the roughly 9% of trading on dark pools and broker-crossing networks (BCNs). These venues offer firms a way to trade without impacting the wider market. In dark pools, for example, order information is hidden until trades are completed, helping asset managers to move in and out of positions without tipping off other participants. As early as 2010, when dark pools and BCNs combined accounted for just 3-4% of overall volume, the European Commission said the increasing use of dark pools raised “regulatory concerns, as it may ultimately affect the quality of the price discovery mechanism on the lit markets”. One, perhaps more obvious, blind spot was OTC equity trading, a nebulous category accounting for nearly 40% of trading last year, which included transactions that may have been double-counted. Industry efforts, backed by regulators, sought to clean up OTC data, but Mifid II brought in more drastic, and arguably disproportionate, measures in the pursuit for transparency. Under Mifid II’s so-called double volume caps, only 8% of an individual stock’s total turnover may be executed in dark pools, broker-crossing networks are banned, and OTC trading is only permitted in very specific circumstances. Meanwhile, Mifid II has revitalised systematic internalisers (SIs), platforms that allow banks and electronic market-making firms to deal directly with counterparties, making them a highly-regulated home for the majority of OTC transactions. What’s surprising is the lack of evidence to support some of these changes. Moreover, asset managers have always been vocal in their support of dark venues, particularly for large and/or sensitive orders. Faced with this radical shake-up, the industry adapted by creating new types of venues. Electronic block and periodic auction markets have burst onto the scene, helping to temper the effect of the double volume caps, while SIs operated by banks and proprietary-trading firms are, as expected, filling the vacuum left by the BCN ban and limits on OTC trading. Request-for-quote markets that are popular for trading ETFs and fixed-income instruments are also starting to enter the fray and will offer yet another option for traders to consider. Lit market share, however remains largely unchanged. In the first eight months of this year lit market share has averaged 42.41% compared with 42.37% for 2017. Some regulators have characterised this shift to alternative venues as an effort to undermine the Mifid II transparency drive. And some of that concern — particularly as it relates to periodic auctions using external reference prices and broker priority, as well as the reporting of bank SI trades — may well be warranted and require rule tweaks. 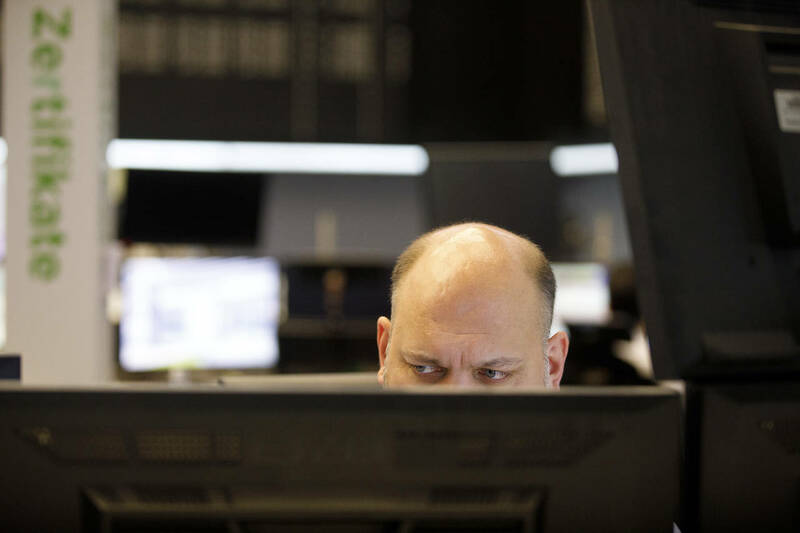 But faced with blunt limits on key sources of liquidity, traders have simply adapted to Europe’s new market structure and are taking the necessary steps to protect their order information in an increasingly fragmented, electronic marketplace. 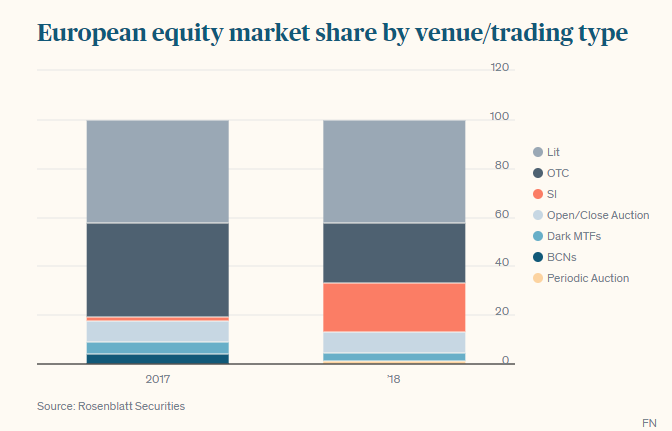 All the while, lit exchanges still hold the largest share of trading — almost double that of the next largest segment — and remain an important source of liquidity. What’s certain is that the multitude of new venues makes proving best execution a much tougher task than ever before. Buyside traders need a solid understanding of the different markets available to them, so they can demonstrate why they selected particular venues or counterparties for a given order. This will take time as traders gather the data they need to assess these different markets but as it stands, the pursuit of transparency is not delivering the desired outcomes for market participants or regulators.